Surely the rest of the process would be pretty straightforward – connect the dots, as it were. Boy, was I wrong. The first thing you'll learn is that, if you plug the Digispark into a USB port on a running Raspberry Pi, the Pi immediately reboots. A sudden drop in supply voltage to the Pi because of a spike in current demand when the Digispark is turned on is big enough to reboot the Pi, as if you had unplugged it and then plugged it back in. While the Pi is off, you have to plug in the Digispark so they boot together. The problem then is that the Digispark is only available for programming for five seconds after it boots. After five seconds, it goes offline and starts running whatever program is resident (by default, a program that flashes the onboard test LED). Of course, the Pi takes longer than five seconds to boot. By the time you reach the login screen, the Digispark has long since gone offline and is happily blinking its LED, completely oblivious to the rest of the world. If you want to program the Digispark, you're going to have to do it on another a computer. No problem: Everybody has a laptop or desktop lying around they can use and any machine should do, right? Wrong. The Digispark is very particular as to what computer it talks to. Plugging it into my laptop gave me nothing when I ran lsusb from a terminal. By running dmesg, I got what you can see in Listing 1. Moving it to another port, and then to an external hub, and finally to a cable did nothing to solve the problem. My computer and the Digispark stubbornly refused to acknowledge each other. Interestingly enough, the Pi also has no problem recognizing the device, but, as mentioned above, the five-second window makes it impossible to program from the Pi. Note how the device ID has changed completely. Compare the IDs and commercial names in the two listings and remember them, because it will come in useful later. Apparently, another way for the Digispark, and other USB devices, to be recognized and connected is to use an external powered USB hub (i.e., one that plugs into the mains). I have yet to try this. 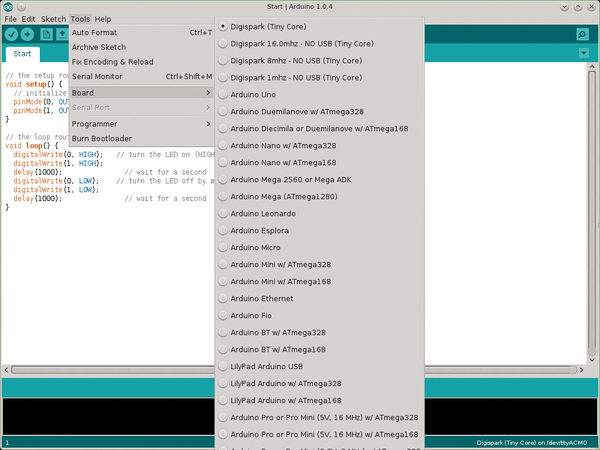 While you are programming the Digispark in your new Arduino IDE, keep the device unplugged from your computer. When the time comes to copy your programs over, choose Tools | Board | Digispark (Tiny core) (Figure 2) and Tools | Programmer | Digispark and hit the upload button (the "Play" button with an arrow pointing to the right in the toolbar). Figure 2: The version of Arduino supplied with the Digispark is preconfigured for this tiny board. appears in the console window at the bottom of the IDE. Now is when you plug in the Digispark so your program can upload. The uploader informs you whether or not it has been successful.